If ya gotta go out, go out with a bang. What better way to wind up a month dedicated to poetry than with a festival for the same? 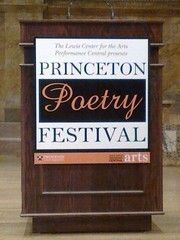 Princeton Poetry Festival (PPF), held April 29 and 30 inside Alexander Hall on the Princeton University (PU) campus, was a miniscule affair compared to Dodge but a welcome one for, as guest poet Mark Doty observed, the die-hards who came to hear and discuss poetry indoors despite the gorgeous Spring day while a festival with food, music, and all sorts of other entertainment was taking place outside. Aside from Doty and despite the festival’s size, PFF certainly brought the star power. Guests included PU staff members Paul Muldoon, Michael Dickson, and Brenda Shaughnessy as well as other notables such as Charles Simic, C. K. Williams, and Sharon Olds (full list here). These were the bread and butter of the festival, which at least on the only day I attended mainly relied upon the nationally known poetry professionals to read their academia academically. I’ll say it again: Princeton Poetry Festival. What about that phrase doesn’t pummel the mind with prim and proper pompousness? The poetry was dense and masterfully crafted, everything that originally made me fall in love with that art. Mark Doty and Brian Henry infused their words with much passion, but others featured as readers fell into the rut of patterned pauses and monotone drudgery. If you weren’t there for the language, you weren’t getting much. The only session that wasn’t a reading was a horribly banal-sounding panel discussion, Poet as Philosopher, which featured five poets competently and enthusiastically moderated by Michael Dickman. For a panel that I’ve seen start out as and remain topical chaos at many a poetry festival, PFF’s iteration tackled it thoughtfully and thoroughly. There were poems read, but they did not take center stage. Discussion remained on topic, and the only thing lacking was time for additional Q&A from the audience. A write-up is forthcoming, as some of the ideas explored were very much worth repeating. The only reason I missed the first day was due to calendar mismanagement on my part. Luckily, PFF flyers were up and about throughout Princeton’s Communiversity Day celebration as well as taped to the Poetry New Releases shelves in Labyrinth Books on Nassau Street, where I was picking up a recent collection of Kabir. I would have very much liked to have attended the first day but am grateful for the chance to finish up the month with the dense shot of linguistics and contemplation that April 30th provided.